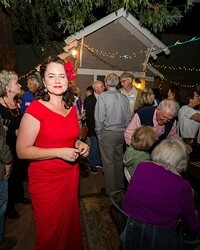 Mighty Heidi: Heidi Harmon wants SLO to be a net-zero emissions city. Can it happen? SEEING GREEN SLO Mayor Heidi Harmon has ambitious plans to move the city toward net-zero emissions by investing in cleaner energy sources and creating incentives for energy efficiency. Before becoming the mayor of San Luis Obispo, Heidi Harmon often searched for symbolic victories in her progressive and environmentally centered political career. One of her favorites happened during her campaign for the 35th District State Assembly seat in 2014. Running against Republican incumbent Katcho Achadjian, Harmon recognized from the outset that she’d likely lose the election—and she did. “God himself could’ve ran and lost against Katcho,” Harmon pointed out. But Harmon didn’t necessarily run to win. She put her name in because she saw Achadjian was running unopposed. She believed that a key political race in the state deserved robust debate about important issues for the Central Coast like climate change and economic inequality. Victory for Harmon in that campaign didn’t come on Election Day but rather in Achadjian’s final campaign ads, which featured him standing in front of solar fields. You won’t find an issue closer to Harmon’s heart than climate change. The global crisis is what compelled her into politics. She believes it’s the “defining issue of our time.” And when you listen to her talk about it, it doesn’t sound like just a line. Harmon’s first ventures into activism were serving as the climate task force chair for the Sierra Club and the local director of the global nonprofit 350.org. She organized rallies and marches for environmental causes. She jumped on the board of the League of Women Voters to try to establish climate change as one of its causes. Her run at the Assembly seat in 2014 was a big step, but it was the year after that, 2015, that would change her life again. At a convention for progressive politics, she met U.S. Sen. Bernie Sanders (I-Vermont) before he decided to run for president. Harmon was deeply inspired by Sanders and his politics (“I was like heart eyeballs,” she admitted), and she wound up organizing his presidential campaign on the Central Coast and attending the 2016 Democratic National Convention as his delegate. d by the DNC’s efforts to undermine Sanders. After a period of discouragement, Harmon flipped her anger into action. It worked. 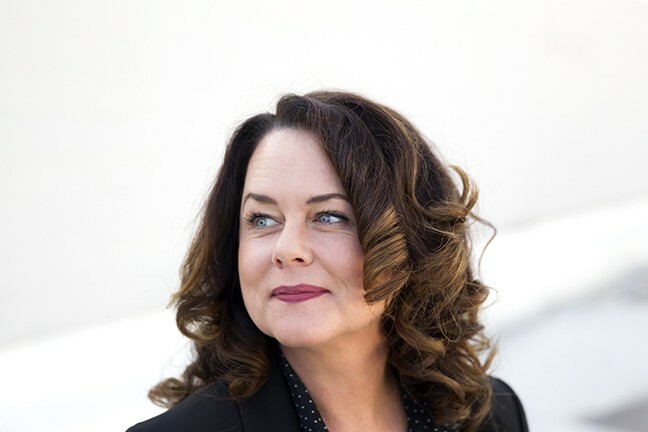 With an established base of support in SLO, Harmon joined the city’s mayoral race on a platform of strong community engagement, and she won the seat from three-term incumbent and longtime city leader Jan Marx. Just like that, the days of Harmon’s looking for symbolic victories in politics were over. As the new mayor, Harmon said she’s focused on delivering on her boldest campaign promise: to make SLO a net-zero emissions city. A net-zero city is one that is carbon neutral, or, in a few more words, a city that produces as much clean energy as it consumes fossil fuel energy. While undoubtedly a lofty aspiration, many cities in the U.S. are working aggressively toward net-zero status, like Lancaster, Calif.; Aspen, Colo.; Burlington, Vt.; and others. “There’s no reason we can’t have the top-notch, most appropriately aggressive climate action program,” Harmon said. For SLO city to achieve a net-zero profile, it must do two things simultaneously: significantly reduce its current levels of greenhouse gas emissions and aggressively ramp up the amount of clean energy it invests in. Together, the two pursuits could lead to a net-zero equilibrium. If you ask R. Rex Parris, the mayor of Lancaster in Los Angeles County, it’s not only feasible, but economical. Parris has led an ambitious effort since 2010 to chase the net-zero goal by investing in a wide array of renewable energy projects, from forging public/private partnerships for solar fields, to turning the city into a utility called Lancaster Choice Energy that offers 100 percent clean energy at rates competitive with investor-owned utilities. Although SLO’s population is less than half of Lancaster’s, Harmon believes SLO can move in a similar direction through investments in renewable energy, policies and incentives to improve citywide energy efficiency, and rallying the community around the net-zero goal. The long road to net-zero emissions likely begins with a plan that already exists. The 2012 SLO Climate Action Plan, crafted in response to the California Global Warming Solutions Act of 2006 (AB 32), maps out a series of strategies to reduce citywide greenhouse gas emissions to 1990 levels by 2020. In the plan, SLO breaks down current emissions levels into four categories: transportation (responsible for 50 percent of all emissions), commercial/industrial (22 percent), residential (21 percent), and waste (7 percent). The document then identifies seven areas where the city can take steps to cut its carbon footprint: buildings, renewable energy, transportation and land use, solid waste, water, parks and open space, and government operations. Considered innovative when the City Council adopted it, the more substantial elements of the Climate Action Plan haven’t been as aggressively pursued in its five-year life as Harmon and newly elected City Councilwoman Andy Pease would’ve hoped. The new City Council showed a desire to change that when it named climate action as one of the four major city goals for the 2017-2019 budget cycle. Two other city goals—housing and multi-modal transportation—are also closely tied to the plan since they’ll reduce vehicle miles traveled. One of the first moves for the city will be to hire or appoint a sustainability coordinator. The sustainability coordinator will work with and oversee a “green team” comprised of employees from each city department to make unified progress on the climate objectives. A Climate Action Coalition is also in the works to facilitate a more regional climate action effort in SLO County. That sense of structure is one common thread in communities that successfully make progress on climate action goals, said Michael Boswell, head of the Cal Poly’s City and Regional Planning Department, former SLO city planning commissioner, and co-author of the 2011 book Local Climate Action Planning. 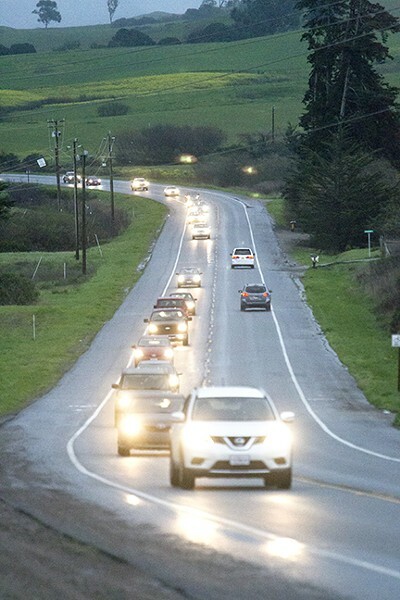 Reducing emissions in SLO starts with cutting down on driving. Vehicular greenhouse gas emissions is the city’s No. 1 environmental bugaboo. Pass-through traffic is a large contributor to that, but so is the lack of housing availability and affordability, which forces many workers to commute into the city. The city says it’s trying to address that with the proposed Avila Ranch and San Luis Ranch housing developments that could bring 1,300 housing units to the city’s fringes by South Higuera Street and Madonna Road. While those two projects—and smaller “infill” housing developments coming down the pike—are controversial among some residents, Assistant City Manager Derek Johnson is quick to point out the long-term environmental benefits. “If you can put people closer to jobs, in houses that are going to be net-zero energy use, you’re dealing with the biggest part of the problem,” Johnson said. SLO is also chasing a 20 percent bike rideshare goal for 2020, with a priority to add more bike lanes and boulevards to make its roads more accessible. In addition, the action plan includes an emphasis on more electric vehicle infrastructure (charging stations), and upgrading the city’s vehicle fleet to all-electric or hybrid cars. Buildings’ energy usage isn’t as much of a problem with new construction in SLO as it is for the older buildings. Given that 60 percent of SLO’s homes are rentals, one challenge will be to find ways to incentivize owners and landlords of old homes to make upgrades that will improve their energy efficiency. Additional reduction methods include a new water reclamation facility, a 75 percent waste diversion target for 2020, renewable energy projects and standards, and urban tree plantings. SLO can try to cut down on its energy usage all day long, but to reach a net-zero equilibrium the city will likely need to take steps to offer residents and businesses a cleaner source of energy than what’s offered by investor-owned utilities. Community choice energy (CCE) is one big-picture solution that several California communities, including Lancaster, have adopted. CCE is when a city, county, or a coalition of agencies leverage residents’ purchasing power to negotiate contracts with renewable energy providers and in turn become a utility to the community. Areas that have started CCEs include Sonoma County, Marin County, San Francisco, San Mateo County, Santa Clara County, and Lancaster. A coalition of Monterey, Santa Cruz, and San Benito counties is in the process of forming one as well. SLO County is currently drafting two feasibility studies for separate CCE proposals. One is a partnership with Ventura and Santa Barbara counties, and the other is a partnership with SLO city. Cal Poly’s Boswell said CCE programs are easier to set up at a regional level than a city level. Jon Griesser and Chris Read of the SLO County Climate and Energy Programs told New Times that those feasibility studies, authorized by the SLO County Board of Supervisors in 2015, are going to be presented to the board in late summer or early fall. “Staff has been working closely with consultants and other agencies to determine the feasibility of both of these options, including various participation scenarios,” Griesser wrote to New Times in an email. The key to CCE programs is finding the cleanest mix of energy providers at the right price points, whether that’s a solar farm in Nevada or a wind farm off the coast. Then it’s about solving the complicated calculus of lining up the logistics. One benefit of CCE programs is the amount of revenue it brings to the agency that operates it. If that’s SLO city, it could open up a reliable funding source for a variety of investments including offering rebates and incentives for home energy efficiency projects. Councilwoman Pease said she understands that substantial government programs like CCE are prone to political opposition. 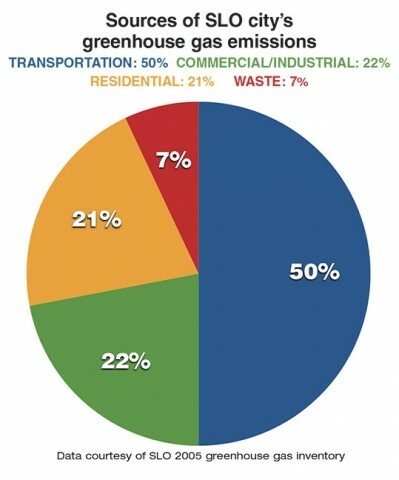 COMMUTING AND EMITTING Half of SLO’s total greenhouse gas emissions stem from transportation. New city housing and bike friendly streets will attempt to curb that. In the case of a SLO CCE, the political barrier is likely to come at the SLO County Board of Supervisors level. The new conservatively run board will need to approve any CCE proposal that comes forward. If CCE doesn’t pan out, Pease still thinks the city can look for its own renewable energy investments in solar farms or rooftop solar projects through public-private partnerships. The state laws that are continually pushing California to a lesser carbon footprint also help with the local effort. Aside from the AB 32 mandate to reduce emissions to 1990 levels, the state has a net-zero building standard that will take effect in 2020. On the supply side, investor-owned utilities like PG&E are expected to have a 33 percent renewable energy electricity mix by 2020. While investor-owned utilities missed the state’s target of 20 percent renewable energy in 2010 by 2 percent, they’re on schedule to hit the 33 percent mark, according to the California Energy Commission. Individual cities and counties can work within those minimum state standards or push to further reduce emissions. For SLO to realistically achieve a net-zero status in the near future, it must go well beyond what the state mandates. How far is Mayor Harmon willing to go?